Cannibalism has been found to be a normal behavior in many animal species in the wild. It may be part of natural selection, a way to eliminate a young animal that is sick or unhealthy. A mother may cannibalize one or more of her unhealthy young in order to cut her losses and devote more time to the others. Research is lacking in the opossum; however, it does not seem to be a “normal” behavior in the wild opossum. Although the incidence is rare, it has been known to occur in captivity. When it occurs, the reason can usually be traced back to poor husbandry. In addition to the obvious definition of eating conspecifics (other opossums), it also includes self-mutilation. Prevention: It is important to provide adequate cage space, limit the number of opossums in each cage, and provide multiple levels in the cage/run. Contact O.S.U.S. for housing recommendations. Never overcrowd! 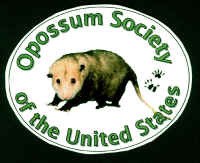 It is better to turn opossums away then to subject the animals to an overcrowded situation setting them and YOU up for the possibility of cannibalism! Also, minimize stress. Do not talk to the opossums and/or pet them. This is stressful, not calming! Decrease stress by offering several den boxes and hiding areas so that one may get away from the others, if desired. Keep the cage or a portion of it covered so that the opossums do not see you. Keep pets and children away. Keep noise levels and contact to a minimum. You should only go into the cage to check the opossums, monitor their health, medicate if needed, feed, and clean the cage. Provide a proper diet in an adequate amount. Always make sure fresh water is available and that there is enough food for all opossums. If you have had a problem with cannibalism despite adequate housing, no overcrowded situations, and minimal stress then consider feeding the “Modified Jurgelski Diet (MJD).” Many rehabilitators have found the MJD to reduce/eliminate the incidence of cannibalism in litters fed this diet. Contact O.S.U.S. for more information about MJD. It is best to avoid mixing litters. If limited caging requires you to do so then preferably introduce the young before the eyes have opened. If introducing after eyes have opened then do so with extreme caution and careful monitoring. Watch for problems and any signs of aggression. Watch for missing ear tips, tail tips, bloody digits, punctures, and any sign of blood in the cage/bedding. Watch for lunging or snapping at each other. Listen for “cacking” sounds. Watch for signs of rejection. You may notice one animal has separated from the others and is hiding in a corner. Watch to see if the others are snapping at it or preventing it from reaching the food bowl. If any of the above signs are observed, then separate immediately! NEVER place a sick or injured animal in a cage with others! Even a slight wound may entice the others to attack and cannibalize it.